wins 4-0! & Are Your Round 1 Champions! Poll: Recommend KT vs SKT T1 Game 1? Your vote: Recommend KT vs SKT T1 Game 1? Poll: Recommend KT vs SKT T1 Game 2? Your vote: Recommend KT vs SKT T1 Game 2? Poll: Recommend KT vs SKT T1 Game 3? Your vote: Recommend KT vs SKT T1 Game 3? Poll: Recommend KT vs SKT T1 Game 4? 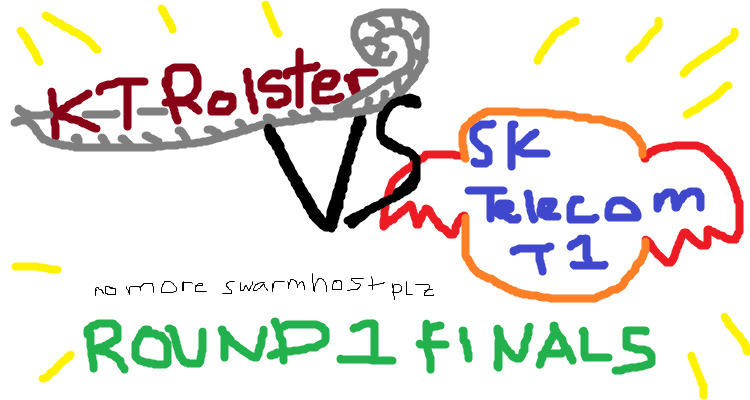 Your vote: Recommend KT vs SKT T1 Game 4? Poll: Recommend KT vs SKT T1 Game 5? Your vote: Recommend KT vs SKT T1 Game 5? Poll: Recommend KT vs SKT T1 Game 6? Your vote: Recommend KT vs SKT T1 Game 6? Poll: Recommend KT vs SKT T1 Game 7? Your vote: Recommend KT vs SKT T1 Game 7? Twitch VoDs are Sub only mode now. Poll: Who are you cheering for? Your vote: Who are you cheering for? Why isn´t this played on a weekend? Proleague hurting themselves for no reason again. Also, all I want for Xmas is for Flash to face Parting and beat him in a most humiliating fashion. But as reward for Rude's epic LR yesterday I have to cheer for KT so...hmmm... go TY! all kill those noobs!